Hobby Lobby is in the middle of a lawsuit with the Federal Government over the new Healthcare mandates that require Hobby Lobby to pay for what they feel are abortion-causing drugs, such as the “Morning-after” pill. (UPDATE: Hobby Lobby won this case in the summer of 2014.) In a December 2012 open letter, Hobby Lobby CEO David Green stated this action would go against his moral standards, leaving them no other choice than to go to court and fight. Whatever your feelings are about this case, it should cause you to think about the way we as leaders live out our integrity when things get tough. I mean REALLY tough. Not like “should I pay to license the software for every computer we use it on?” but “Should I stand on what I believe even if it means closing down my $3+ billion business that employs over 20,000 people?” This is where INTEGRITY is really tested. Integrity requires that you act on what you stand for by sticking to your principles and doing what you said you would do in all situations. As leaders, we often face challenges in reaching our goals that can tempt us to compromise our integrity and damage our reputation. The reality is, doing what is right will always get you the results you want. It may take longer this way, but you will achieve success AND keep your reputation along the way. This sets the example for those who will follow us and builds trust and confidence in your leadership. Leading with Integrity comes through years of practice with the little things. Know what you believe and how that affects your actions BEFORE you need it. I base my decisions on Biblical truths that have been the foundation of what I’ve done in my life. This may not be your foundation, but all of us have a standard based on things we believe and have learned over many years. Live out what you believe with your actions so your team can rise up to meet your standards. You can’t go around cheating suppliers and then be angry when employees steal from you. Don’t be quick to minimize the value of doing what you should in the small things; they make it easier to live out your standards in the big things. When my daughter was very young, I won tickets to a Lakers game. The price of food there is crazy expensive so we bought things ahead of time to take in and enjoy. However, at the door we read a sign saying “No Outside Food Allowed,” and my daughter wanted to know what we should do. It would have been easy to sneak it in under our jackets, but we knew that was dishonest. So we tossed it all in the trash and enjoyed some Lakers treats and a clear conscious. She still remembers this simple little event 15 years later. Martin Luther once said, “If we don’t stand for something, we fall for anything.” Taking a stand can be hard when so many are counting on you, and so much is riding on your actions. Make sure you surround yourself with others who have faced tough decisions and made hard choices before. By the way, make sure that those you let into this inner circle, model the same character and integrity that you do, otherwise the input you get in hard times can actually make things worse. Listen to their wise counsel and get support for the decisions you make – you’ll need it. Let’s face it, a person who needs a job from you may not be quick to tell you when you’re not living up to what you preach. Self-preservation can keep most employees from providing candid feedback on certain subjects. You need to let others outside your company be involved in your life and business enough to see areas that may need some fine tuning. Members of Renaissance Executive Forums say that being in our peer groups has provided them with a level of personal and professional accountability. These groups provide candid feedback from people we respect and who know us well enough to help us keep our integrity intact; even when things get tough. If this sounds like something you value, please email us at info@REFDallas.com, or call us at (469) 269 – 5148 and let’s dig a little deeper. 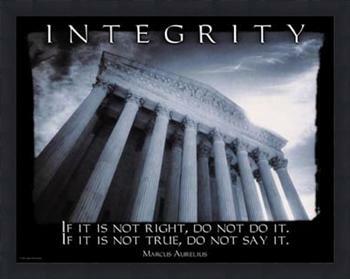 Integrity is certainly not a word to use lightly. When you meet a person of integrity you will typically see they LIVE with Integrity. They do not talk about it, and certainly will not boast of being a man of high integrity. You will see they live with 1). Purpose, 2). Positive Personal, & Professional Pursuits, 3). Planning; and 4). Financial Stewards Personally, professionally and in the community. I like to say, they do what they say they will do. When entering into agreements or even just in conversation, you know their Yes is a yes and their No is a no as I believe it is in Matthew 5:37. During the time I worked with you at EFA Processing, I saw you as a man of integrity and your words matched your actions.